Asa is currently providing TDOT Local Programs NEPA and Design services on Phases 1, 2 & 3 of the US 41 Corridor Enhancement Project between McBrien Road and Kingwood Drive. The projects include drainage infrastructure upgrades within the corridor; the construction of a 10-ft wide multi-modal path on the south side of Ringgold Road; a 5-ft wide sidewalk on the north side of Ringgold Road; cub & gutter; ADA compliant improvements; pedestrian level lighting; landscape amenities; and stormwater park amenities. The first three (3) phases of the Corridor Enhancement project is being funded through Transportation Alternatives Program Grant, Multimodal Access Grant, and local match funding. 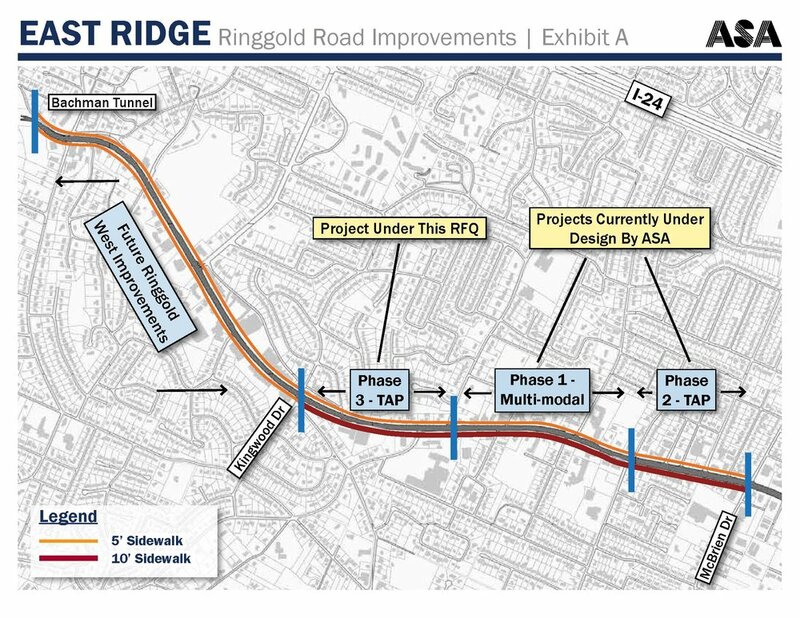 Asa was also selected by the City of East Ridge in the Summer of 2017 to provide stormwater modeling, design and CEI services on the remaining western section of the Hwy 41 corridor between the Bachman Tunnels and Kingwood Drive, thereby completing the pedestrian connection and drainage improvements along the western half of Hwy 41 within the City. This 4th Phase of the Corridor includes the construction of new stormwater infrastructure, including stormwater detention/infiltration amenities and parks; 5-ft wide sidewalk on both sides of US 41; curb & gutter; ADA compliant improvements; pedestrian level lighting; landscape amenities; bus shelters, and street furnishings. This project is 100% funded by the City of East Ridge. Construction is expected to begin as early as the fall of 2018 and be completed within 18-months. Key Asa staff assigned for the PE-NEPA Phase include Jeff Sikes (Sr. Projects Manager), Chris Davis, PE (Sr. Transportation Design Manager); Carmen Harvey (Transportation Designer); Micah Duffey, PE (Civil Design Engineer), Tami Johnson-Praino (Engineering Designer); Allen Jones, RLA (Planner/Landscape Architect), Jennifer Wiseman (LA Designer); and Roger Riemer, PLS (Surveyor).